Well, this is possibly the last night I’ll be spending on the “Air Bed of Wonder,” which is the name I just came up with for the double-stacked air mattress/throw pillow/blanket covered area on which I sleep. To find out why I’m sleeping on top of two air mattresses we need a quick recap. About a month ago, K and the Dude came to visit my basement dwelling. The one air mattress we had at the time was suitable for K and I…but it was also 4 inches off the ground, making it not suitable for two humans and a giant German Shepard who thought it would be fun to see if we could break the weight limit. Needless to say, he succeeded, which caused a “slow leak” situation that I discovered after they left when I woke up laying on a plastic covered floor. Basically, because of this slow leak, every evening I would go to sleep on an inflated air mattress; and every morning I would wake up as the mystery meat in an air mattress hotdog. It’s hard to describe unless you’ve experienced it. (If only there was a Mythbusters episode about slowly deflating air mattresses. Then I would have felt more prepared for this situation.) For the inquiring minds out there, when the bed deflates, air pushes to the sides of the bed so that as you slowly sink to the floor, you’re enveloped in a cocoon of vinyl. It’s half comforting, half frightening. Fast-forward to a week of basically sleeping on a tile floor for half of the evening and K decided we could spend the money to get another one. (Noble of her, since I was the one using the bed.) K purchased a new mattress for me, which I picked up on a trip home. But, when I got it back to Minnesota, I discovered that our pump did not have the correct nozzle to inflate the new bed…which meant another night of joy. 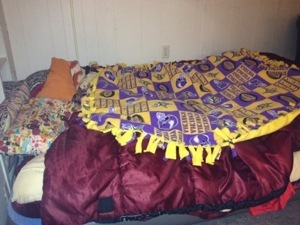 And that’s why I’m sleeping on the “Air Bed of Wonder”…and why I’m not terribly sad to retire it after tonight. At least I get to wake up to this one more day. Then it’s off to life in the burbs.